Parrots may not make good pets, but I was thinking about this: There are endless reasons why I love them anyway. I’d never give my birds up if I had any kind of a choice! It takes a saint-like amount of patience to live with one…as well as an immunity to mess, noise, and waste…yet if you can tolerate the negative aspects of ownership, a parrot can make a wonderful life-changing companion. My parrots are typical. They are affected by seasonal hormones that make them many times more likely to bite and scream and act like little terrors. After chewing up my valuables (and maintaining an uncanny knack for identifying these things), they fly around like creatures possessed and steal foods that are bad for them even when I’ve lovingly prepared a wholesome meal. No, I adore my flock because they are birds, not cats or dogs, and because they do bird things. I enjoy all the little things that differentiate them from our domesticated pets. Parrots are not domesticated, and this is the root of all their behaviour. Parrots are true to who they are. They do exactly what they want, when they want, and they don’t have ulterior motives – such as pleasing you. A parrot follows his instinct. This is exactly what makes them so unsuited to captivity, but also what endears them to me. I like that predictability (which is in itself sometimes unpredictability). I am enamored of their soft, brilliant feathers, of course, but more so with their bold personalities. Everyone one of them is unique, and has his or her own likes and dislikes. For example, Mavi hates red cabbage. No matter how I disguise the occasional bit of red cabbage, he will not touch it. Ptak loves strawberries, but Mavi won’t touch those either. Bobo the cockatoo loves everything, ever, while cockatiel Mishka only liked green things. If you had food she wanted, she’d be dangling from your collar and doing acrobatics to try and get some – and if you still weren’t sharing, she’d try to stuff herself into your mouth or casually saunter right through the middle of your plate. These little things make parrots very special. To me, it totally makes up for the fact that you shouldn’t be cuddling them, or that you will sometimes get bitten randomly. When I look into the eyes of a parrot, I see someone looking back at me – more even than with dogs, cats, or horses, which are all very intelligent and wonderful companions. Parrots are thought to be sentient. I appreciate that when I talk to my flock, they are aware and truly listening. Or at least I feel like it. 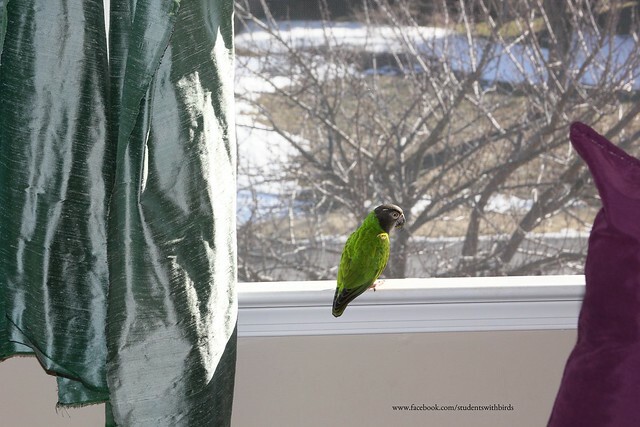 Senegal Parrot in the window. Parrots also smell good – or at least, mine do! Mishka smelt of fresh powder… I used to bury my nose in her feathers every now and then. You can guess how much she liked that. I loved her un-tameable wildness, how she used to mimic the phone dialing, or ‘sing’ the music to one of my favourite city-builder games. I came to admire her fierce independence. Everything was done on her terms. If she wanted to be with you, she’d let you know by trumpeting the song of her people into your ear. If not, she’d self-amuse on top of the door. She was courageous and neurotic at the same time. I loved her for her for being, well, Mishka. In truth, there are endless small things to adore about each individual in my flock. They test my patience every day, but I always smile when my littlest parrot, Ptak, pipes, ‘Baby bird, you’re so pretty, bird!’ and makes up his own grammatically-correct sentences from words I taught him in a different context. Or when Mavi the Senegal declares, ‘You’re so CUUUUTE. I love you!’ as I wake him up. They’re mirrors of your home life. If you shower them with love and respect, they reflect it! In the end, it’s the small things that make even the toughest times bearable. It takes just one sweet little moment to remind me that today was tough, but tomorrow can be better. I think the best and final part of having parrots is that you will never be alone again. I am flock now. Their neediness can be wearing; parrots thrive on social interaction, making it a prerequisite of life with a bird. Their highly social nature is a pro and a con, but really a pro – if you’re ready for the sacrifice. The problem arrives when the novelty of that super-close companionship wears off. When it begins to impact your life, will you still think it’s so fun or interesting? Many people don’t. So why do I do it? This is a question I’m asked a lot, especially after I’ve been honest about my life with parrots. It’s a challenge! If you’ve read some of the articles on this blog, you, too, may reasonably wonder the same thing. Well…I share my life and home with parrots because are very lovable – and they need humans who can tolerate their quirks and wild nature. 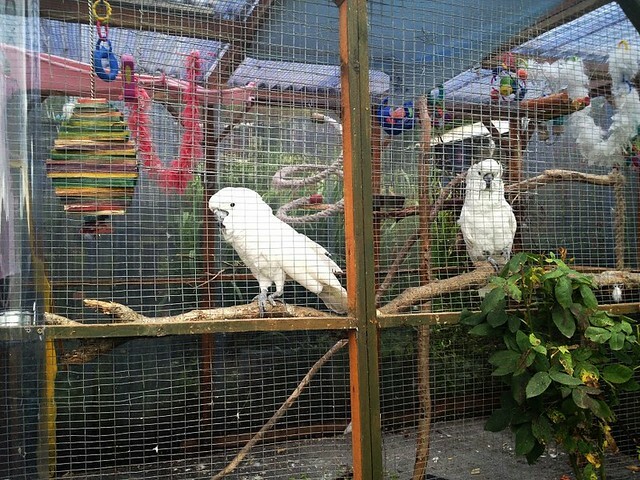 Captive parrots can never be released into the wild. They are completely and utterly dependent on people. In the end, however, their intelligence costs them their homes. 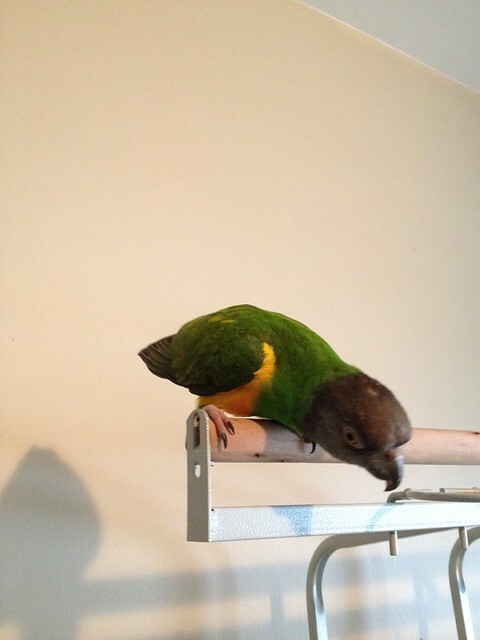 Parrots are always looking for something to do, things to chew or explore, and often that leads to trouble. It is no longer so cute after your parrot escapes his cage for the fifth time while you’re out and destroys your house. Or chews your antique furniture to bits. Or screams until your eardrums ache and your neighbours file noise complaints. 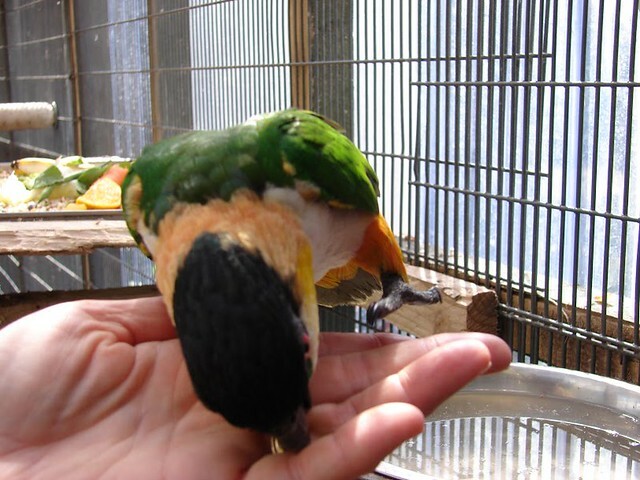 I aim do my part to help captive parrots, and what that means to me is adopting the birds I can provide for and doing my best to give them good lives – plus writing about the truths of parrot ownership so that others can learn from my experiences. Life with parrots is about sacrifice. In the end, I love that they taught me selflessness, compassion, and patience. So yes, they may be terrible pets, but I choose to remember the quiet moments and let the bites and the frustrations slide past. And mostly I stay sane doing it! Senegal parrot looking to step up. I love this! I often post pictures of my tiels in facebook, instagram and people would say “ooh they are so cute and I want them” and I always end up discouraging them from getting one. Having parrots as pet require big responsibility. They are naughty, messy and big screamers and if you want to get them because they are “cute” what would you do if they aren’t cute anymore after you got bitten from their mood swings? I hope I’m not being snobbish for saying this but loving a parrot requires a lot of work and if you don’t prepare for it – the birds will suffer, abandoned and dumped on the side of the road (One of tiel owner in facebook group told me about this. How horrible people can be??? She adopted the bird so it’s all happy ending but still so many abandoned birds out there!! So true, parrots are not pets like a dog or cat. Charlie’s my little buddy. It took my husband a few months to understand that she was never, ever going to fly to him when he called her from across the room. You have to walk over to her and offer your arm for her to jump on. She does things on her terms. Love this! 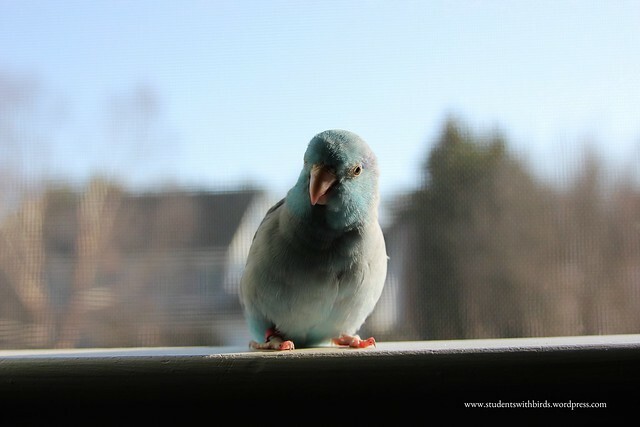 I wouldn’t trade mine for the world either, but I do the same as the above commenters – if people express interest in having a “pet” parrot, I discourage them and tell them all the negatives first. I would rather people go in well prepared than assuming they’ll be getting a dog-like pet. Excellent piece! I’m sure anyone who is owned by a bird can relate 🙂 Would like to follow your blog. Single old man with Forrest the one year old eclectus here. He was very poorly raised and came to me wild,angry and mean. Four month later investing in his trust he has now become my best friend and me his. I have never been able to sneak up to him! If I peek around a door to check up on him hes there looking at me. If I walk though another room past his room he peeking at me. If In the garden he’s at the window watching me. Hes not perfect however and has developed a nasty habit. Sitting on my shoulder if a ignor him for to long he pokes his beak in my ear! 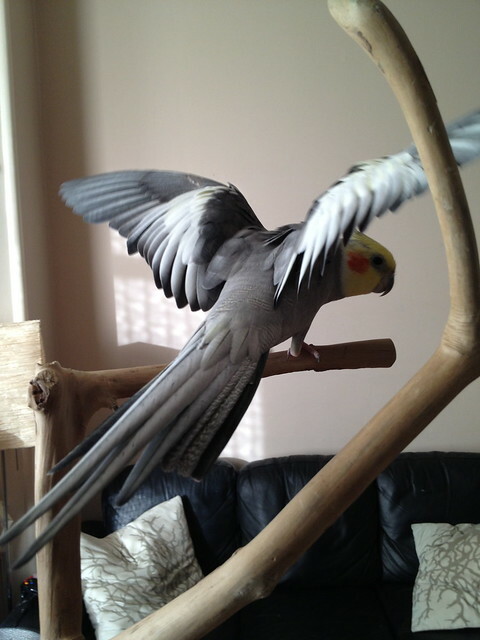 It is easy for me to forget he a bird, he is instead my companion. Together I feel like part of a team. Thank you, for such an honest article! I totally agree with you, birds do not make good pets and I’m glad for people like you, who take time out to try & educate non bird owners about these amazing creatures. I didn’t choose to be a parrot owner, she chose me. Long story short, Sora my galah was an escaped bird to which I tried so very hard to find her owner. Fast forward 2 years, I can’t imagine my life without her. Yes, it’s like raising a 3 year old that will never grow up & there are days where I do question my sanity, but it’s in those moments when she’ll do the most cutest thing & remind me what life was like without her. Sora has made me, and still is making me a better person each & every day. This really helped me because I’m in love with birds, and I’ve been researching on them for almost a year now, And this was one of the most helpful posts I’ve found. I still would love a bird despite all the cons I’ve heard about them!